There is no wrong in wanting to turn the brain cells off every now and again when watching a film; from slashers, druggies, misadventures and anything else under the sun some flicks are just meant for pure dumb fun enjoyment. Serious, nail biting suspense thrillers and horror films will always have a place but so do the just plain all out cheesy, raunchy, over the top films like Peter Jackson’s Dead Alive, Sam Raimi’s Evil Dead 2, Michael Herz & Lloyd Kaufman’s The Toxic Avenger and recent films like the Sharknado series still shows the genre has a ravenous fan base. 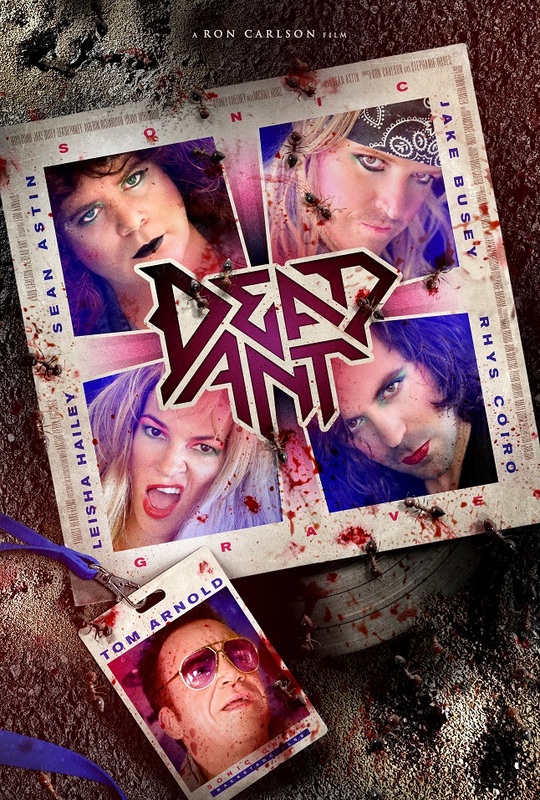 The most recent entry into the fold is writer/director Ron Carlson’s Dead Ant. Filled out with a well known cast the film stars Tom Arnold (True Lies), Jake Busey (The Predator, Starship Troopers), Sean Astin (Rudy, The Goonies) and Rhys Coiro (Entourage, The Walking Dead) The film follows the rock band “Sonic Grave” on their way to play music festival No-chella, their manager played by Arnold assures them this is way better than playing Coachella. Before they hit the stage though they’ve convinced themselves they need another hit and decide to all take peyote in the desert. A Native American who sells them the drugs gives them explicit instructions to follow when under the influence. It’s from here on out we can just sit back, relax and watch the insanity begin. Similar to a Critters, Troll or Tremors our head bangers have to duel a foe and in this case it’s giant killer ants. The action at times is slapstick especially scenes with Arnold but decent enough that it isn’t too over the top. What keeps the film moving is the cast and their interactions; as noted the cast offers laughs from all directions which helps especially when dealing with a film like this. It can fall into two categories: so bad it ends up good or simply good based on its cheesiness; might sound confusing but it’s a thing. With shades of music comedy ala Rob Reiner’s This Is Spinal Tap or The Rocker this is just another element the film offers for its viewer’s amusement. In the end the film is a fun, brainless 90 minute film of glam rockers fighting killer ants… no way else to really put it.